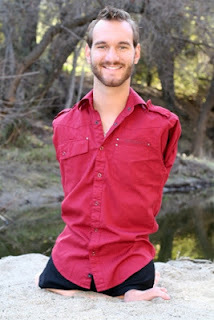 As I watched this clip of Nick Vujicic (the man born without arms and legs) on Oprah's show, I felt the warm love and connection that this guy had with his God. He truly believed not in his disabilities, but in his deep relationship with his Creator. Even though some might think he is an unfinished work, he sees himself as fearfully and wonderfully made by God. He may have had a hard time growing up as a child, but he basked in the love of his parents and his God. He accepted his "so called disabilities", dedicated them to God and God gave him the wisdom and understanding to live with them, still proclaiming the glorious, wondrous love that God has for him. It is truly awesome. Nicholas James Vujicic was born on 4th December 1982 with Tetra-amelia syndrome, a rare disorder characterized by the absence of all four limbs. As a child, he struggled mentally and emotionally, as well as physically, but eventually came to terms with his disability and, at the age of seventeen, started his own non-profit organization, Life Without Limbs. Because Vujicic does not let his disability overtake his life, he has learned how drive, beat a drum, write, pen an autobiography, use the computer, play tennis, and even surf. He is even married. Nick's story tells of a courageous man, his parents' love and acceptance and that there is no mountain high enough and no valley too low to keep you from God's Love. So dwell on the good things that God has done for you and enjoy your relationship with God. You may think that "God doesn't love me", "Nobody loves me". This is a big Lie!! For I am convinced that neither death nor life, neither angels nor demons, neither the present nor the future, nor any powers, neither height nor depth, nor anything else in all creation, will be able to separate us from the love of God that is in Christ Jesus our Lord. (Romans 8:38-39). God's arms are open wide. Embrace him and you will experience a true relationship with the Creator of Love.